16/10/2011 - The Italian Formula 3 2011 ended in Monza with a victory for Team Lucidi Motors, which confirmed the usual attention to the growth of young drivers marking the Italian team. In qualifying held Saturday, Victor Guerin set the seventh time (1'46.250), followed by team mate Edward Cheever (1'46.473); Kevin Giovesi was a little more on the back as he set the eleventh fastest time in 1'47.353. The Brazilian produced a good recover in race one that took him up to the final fourth place, right at the feet of the podium. Cheever and Giovesi had to retire during the first lap instead. 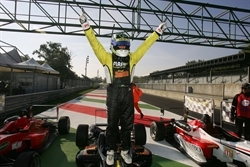 Race two was the last of 2011 and it could not have a better outcome for Guerin, who fought a lot of duels for the first position that were eventually won as the Brazilian driver crossed the finish line ahead of everyone for the first time in this season. Giovesi obtained the sixth place, while Cheever was forced to another retirement due to a technical problem. "The round of Monza ends another year full of work done at the side of our drivers that race by race grew up a lot and aimed to the highest result. Guerin's victory of today ends this process ideally, at least for 2011, confirming that we moved along the right path without forgetting the two victories obtained by Giovesi during this season and the several podiums by Cheever".